This ancient surname is English, but with Norman and pre 9th century Anglo-Saxon and later Norman origins. 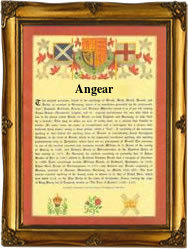 It is derived from the personal name "Ansger", composed of the elements "ans" meaning god plus "ger", a spear, "Gods spear"! Quite why anybody should be so named is unclear, but it is one of a group of personal names which seem to have some semi-religious association. The surname is first recorded in the late 11th Century, (see below), and thereafter recordings have been found which show the surname development over the centuries. These recordings include Willelmus Angeri in the pipe rolls of Warwickshire for the year 1197, Peter Aunger in the Hundred Rolls of the city of London in 1273, and John Anger, a witness at the Assize Court of Somerset". in 1299. Modern spellings of the name include Angear, Angier, Ainger, etc.. and recordings from the church registers include Elizabeth, the daughter of Francis Anger, who was christened at St. Giles Cripplegate, London, on December 12th 1585, John Ainger, who married Elisabeth Abuthnott on July 3rd 1729, at St. Benet, Paul's Wharf, London, and George, son of William and Sarah Ainger, who was christened on July 8th 1752 at St. Mary, Whitechapel, Stepney. The first recorded spelling of the family name is shown to be that of Lefuine Anger, which was dated 1095, Feudal Documents from the Abbey of Bury St. Edmunds, Suffolk, during the reign of King William 11, known as "Rufus", 1087 - 1100. Surnames became necessary when governments introduced personal taxation. In England this was known as Poll Tax. Throughout the centuries, surnames in every country have continued to "develop" often leading to astonishing variants of the original spelling.